This last sunday, 27/10/2002, was election day here in Brazil. Since 1964 we had never elected a leftist president. In 1962 we had Joao Goulart as president, but he was overthrown in 1964, greatly due to foreign influence (READ: USA influence). The violent and bloody dictartorship lasted till 1989. We can roughly say that since 1964 we had the same group of people in power in Brazil. Only know, 38 years later, that may finally change. Lula, from the Workers' Party, was elected with 61.3% of votes. Yesterday i was in a great Workers' Party meeting at Largo da Epatur at Porto Alegre, just after the end of the election period, where people went to celebrate Lula's victory. Suddenly Cristina Ribas pointed to the wheel of a television truck and said "look, mirror project". You can see her and me in the picture, with part of a PT (Workers Party) flag beside me. Lula was a poor boy from northeast Brasil that grew in Sao Paulo. He later became head of a labor union and since 1989 was the candidate for presidence from the Worker's Party. All thanks to democracy he was elected this sunday. One of the things people were screaming on the street was "quem diria, um operario governando a burguesia" (who would thing, a worker ruling the capitalists). It was thrilling to be there at that time. Actually, it was more than thrilling. It made us proud. Not only me, we could see that in other people faces, we could see them happy because there would be a President that would mind for them, would mind for all brazilians, and not perpetuate the same old politics that have been on over almost 40 years and made so many people suffer. It made us believe in a better future. It made us believe in a even happier Brazil. It made us believe that the amazing country we have, even with all these problems, maybe now can get even better. It made us love Brazil like we never had before. 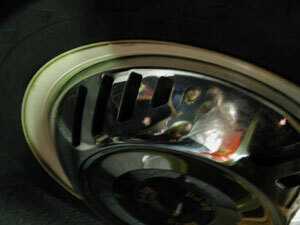 And there you have this picture, with a whole country reflected in a wheel of a television truck.